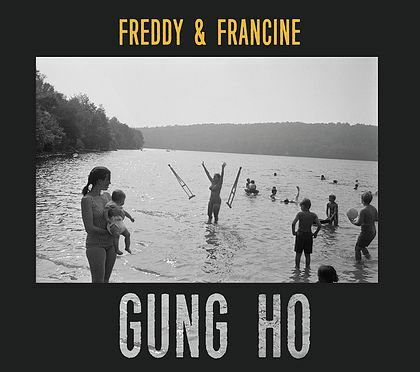 ALBUM REVIEW: FREDDY & FRANCINE, "Gung Ho"
Sometimes a romantic relationship can lead to great art… and sometimes the end of that relationship can lead to even greater art. But when a fractured professional couple get back together, at least to make music, it can be amazing. And that’s the case with Gung Ho, the newest release from Freddy & Francine (who are really Lee Ferris and Bianca Caruso). Having parted and spending considerable time apart, this new offering is quite a staggering collection of songs. Acoustic guitars abound; stellar production – warmth and depth is the first thing you pick up on at first listen. The opening track, “If You Want Me” is a seamless blending of the voices of Ferris and Caruso, with clean guitar figures and a deep, resonant rhythm section – a masterful building of tension and melody combined; “Tryin’ Hard To Love You” has delicious guitar slides in the intro while Caruso’s vocal is both cool and impassioned in this country-fied track and “Father’s Daughter” will send shivers down your spine as you listen to the harmonies, perfectly intertwined and the rich acoustic guitars with the taut, simple drum pattern guides the song. The mournful and soulful “Ray’s Song”, with its gorgeous Hammond track, is a standout; “Sideman” is buoyant, upbeat and not too distant from “Not Fade Away” and “South Of My Love” is neat with its picked-then-chunky acoustic guitar and the two voices – stripped down and on-the-one. Good to know that some relationships can be repaired. If not, we wouldn’t have an album as pleasurable as Gung Ho is to listen to.